I made a crude brass shim to stabilize the crude blade in its crudely bent metal frame; the ugly hole came from freehand punching with the rebuilt leather punch tool. Probably spent as much time doing that as they did on the whole rest of the saw: it’s not a high-quality tool. 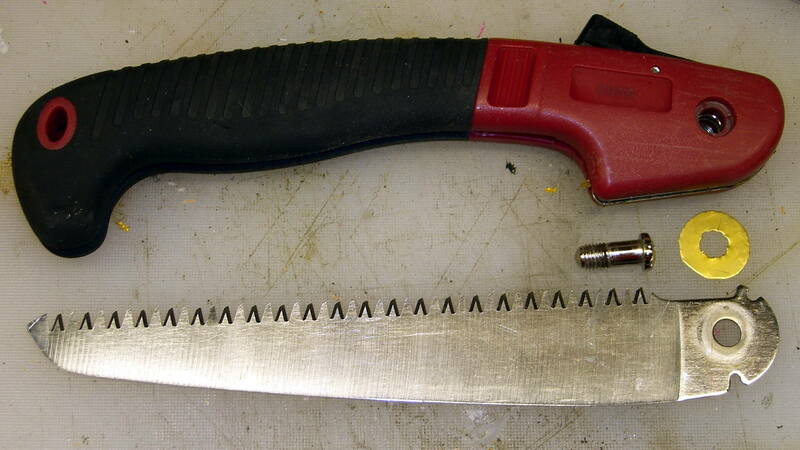 It could be an older version of the Harbor Freight Folding Saw, minus a fancy plastic-encased joint screw. I added a dot of Loctite to discourage this one from leaping to its doom.